The mower cuts grass or hay. The horse-drawn mover was developed in the 1850s and usually came with a 4-foot or 5-foot "cut". The knives can also be held vertically for going to or from the field. They can also be raised or lowered to cut at different heights. By 1920 there are many 6-foot and 7-foot cuts and a few 8-foot cuts. By the 1930s gasoline engine powered mowers were more common. The left wheel drives a gear box which powers the cutting. The left back pedal engages the drive shaft. The power is transmitted down the shaft to a flywheel. A piece of wood, which is no longer there, connected the flywheel to the mower blade. The right handle swings the mower vertical to allow for going to and from the field. The right back handle controls the angle of the mower to the ground. The hitch pole is setup for 2 horses that would be walking to the left of the rows now to be mowed. 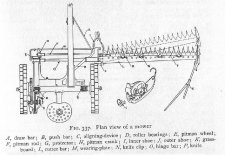 Cyrus Hall McCormick demonstrated First successful reaper/mower at Steele's Tavern, Virginia in 1831. Sales began in 1842. In 1902 the merger of McCormick, Deering and others created International Harvester which is still in business today.